Kevin is an aggressive boy, with a difficult life and a lot of anger, which he happily takes out on his classmates. Secretly, he loves to write poetry, but even while he's creating his poems he's destroying the library books where he finds his words. Eventually his poetry makes him a target for another boy out for revenge and Kevin hits rock bottom. 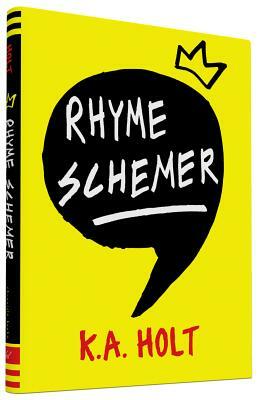 Rhyme Schemer is a great story that really makes you think about the use of language, humor and real life experience in poetry.